The January meeting was the first event adapting the suggested format. There were 20 people in attendance with 3 new members. The wine chosen was Pinot Grigio or Pinot Gris. 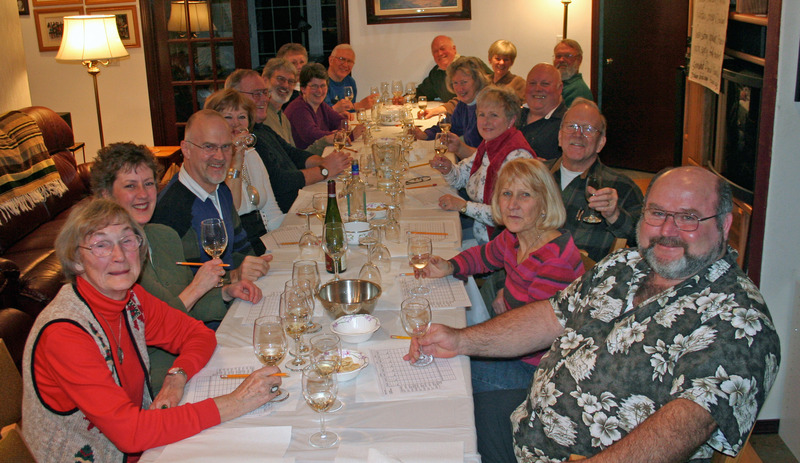 Everyone arrived by 4:00 pm on Saturday with a bottle to be judged, one to be shared and a potluck item. The host/presenter shared information in written form, posters and with orally read materials which included information on the characteristics of the grape variety and its different styles based on locale of production. Two distinctly different wines were presented as the benchmarks for the judging. First an Italian-Friuli – Pinot Grigio and an Alsace-Pinot Gris from France. These very different examples set the palate for the others to be compared. Participants had brought bottles of Pinot Grigio or Pinot Gris to be tasted for comparison. All the wines were put into brown bags to conceal the contents. Each wine was poured, and participants gave points on a UC Davis Tasting Sheet, keeping the benchmark wines in mind for a comparison. After each wine was scored there was an open discussion and the wine label was revealed. The tasting lasted for a little over an hour followed by a potluck meal and wine sharing socially. It was an overall great success and a fine example of our new educational format.